Home » Event » Join Hugo Hamilton and the Narrowbacks at HoCoPoLitSo’s 34th Annual Irish Evening, February 17, 2012. Join Hugo Hamilton and the Narrowbacks at HoCoPoLitSo’s 34th Annual Irish Evening, February 17, 2012. 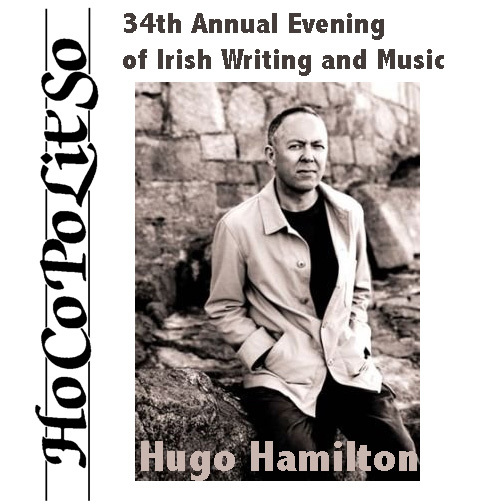 HoCoPoLitSo’s annual Evening of Irish Writing and Music returns with a reading by Hugo Hamilton and performance of traditional and original Irish music by the Narrowbacks. Dublin born novelist Hugo Hamilton will read from his work. The central character in two of his Ireland-based novels, Pat Coyne, is considered one of the most original figures in contemporary Irish literature. In 1992 Hamilton won the Rooney Prize for Irish Literature for The Speckled People as a ‘book for our times and perhaps for all time’. It won the prestigious Prix Femina Etranger in France, and appeared on The New York Times notable books list. Reading will be followed by a concert of traditional Irish music performed by the Narrowbacks – Terry Winch, Jesse Winch, Brendan Mulvihill, Linda Hickman and Eileen (Korn) Estes – and traditional step dancing with performers from the Caulkin School of Traditional Irish Dance. Music from harpist Jared Denhard will open the evening. The event will be held at Howard Community College’s Smith Theatre in the Horowitz Performing Arts Center. Note change of venue. Tickets are now available online here. By timsingleton in Event, Irish Evening, Music on December 11, 2011 .